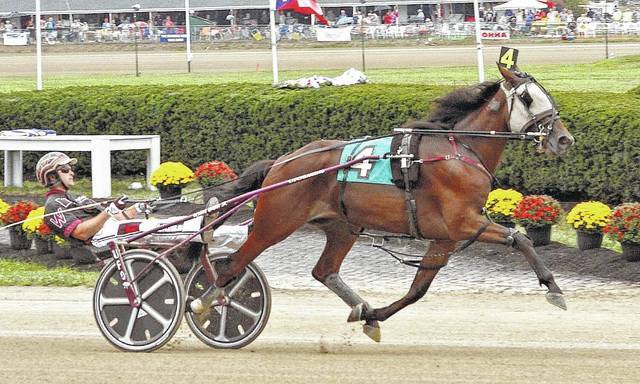 Indiana invader Pinecraft Nellie won the $37,600 Standardbred trot for two-year-old fillies in Tuesday action at the Delaware County Fair. Driver Ronnie Wrenn, Jr. sent Pinecraft Nellie out of the outside post No. 4 and grabbed the early lead. The daughter of Guccio led the field through the first half mile fractions of :30 1/5 and 1:00 3/5. Msnaughtyashill (David Miller) challenged the leader at the three-quarter mile pole in 1:29 1/5, but Pinecraft Nellie was solid through the lane to score a 4 1/2 length victory in 1:58 4/5. Pinecraft Nellie won for the eighth time in 15 seasonal starts and is owned by Summit Pacing Acres and conditioned by Byron Hooley. In the $126,000 (div.) Ohio Breeders Championship for two-year-old colt trotters, Ohio Sires Stake champion Mission Accepted (Ryan Stahl) took the first division in a national season’s record 1:56 2/5. As the starting gate’s wings opened, In My Dreams and Hugh Beatty took the early lead. Mission Accepted, who left from post 5, took command just past the opening quarter in :29 2/5. Mission Accepted took on the mid-race challenges of Joggintothebank (Dan Noble) and Sand Cash (Tyler Smith) and won by 1 ¾ lengths. In My Dreams held on for second and Dontforgetmaster (Josh Sutton) rallied for third. The son of Manofmanymissions is owned by trainer Jeff Conger, breeder Knox Services and David Wills. He now has won over $190,000 in just 7 starts this season. In the second $42,000 division, Cash Lane and driver Kayne Kauffman cruised to a 1 ½ length win over upset minded Dancewithsomebody (Robin Miller) in 1:59 2/5. Cash Lane is trained by Mike Polhamus and is owned by Richard L. Finfrock. In the final division, Sultan Of Cash, the 3-5 betting choice, showed why he was the best when he went gate-to-wire in 1:58. Woof (Mike Wilder) and Count On Cody (David Miller) rounded out the top three. Sultan Of Cash has now won $126,515 and 7 of 8 starts this season. Ronnie Wrenn, Jr. drove the winner for owner/trainer Roger Hughes, Jr.
Today’s 19-race card starts at 11 a.m. and features the Jugette for three-year-old pacing fillies. Pinecraft Nellie and Ronnie Wrenn, Jr. take the $37,600 Standardbred for two-year-old filly trotters Tuesday at the Delaware County Fair.